Twittering your way to heaven? The Roman Catholic Church announced July 16, 2013, it was offering indulgences to anyone who follows Pope Paul Francis on Twitter. 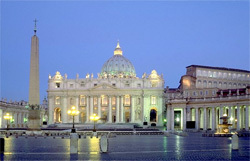 The offer was made by the Apostolic Penitentiary which handles indulgence offers on behalf of the Vatican. The Pope had over 2.6 million Twitter followers prior to the indulgence announcement. In Catholic Theology, indulgences are officially recognized good works used to reduce the amount of time a person spends in purgatory after they die. Purgatory or limbo is a place where Catholics are purged of their sins prior to entering heaven. Though they have been forgiven by Christ, provided they went to confession, they still need to be cleansed of their sins. There are no Bible verses mentioning purgatory, so the Catholic church uses Apocryphal books to defend their position. The primary verse is found in 2 Maccabees 12:43-45 which intimates financial sacrifices (silver) and prayers for the dead can help people at their resurrection. This is also the verse Catholics use to justify prayer for the dead. The book of Maccabees is a Jewish apocryphal book and is not considered scripture by either Jews or Evangelical Christians. Indulgences were introduced in the 1300s and provided an official recognition of good works. In order for a good work to qualify as an indulgence it must be approved by a Priest, usually at confession. However, the process was corrupted when financial donations to the Catholic Church were considered an indulgence. It quickly became a cash cow for Popes to raise money for their various building projects. It was often considered a shake down by people of the time, as Papal envoys extracted huge sums of money for indulgences. The protestant church formed as a direct reaction to this abusive sale of indulgences. Today, indulgences are traditionally obtained through good works, though priests performing memorial masses for the dead — which is considered an indulgence — are paid for this service, though usually a minimal amount. Among other things, Catholics can obtain indulgences by making pilgrimages to events such as the Catholic Church’s Youth Days, reciting a mass or even by walking up the sacred steps in Rome — believed to be the steps Jesus walked on when He came before Pontius Pilate. And now most recently, you can add following the Pope on Twitter.